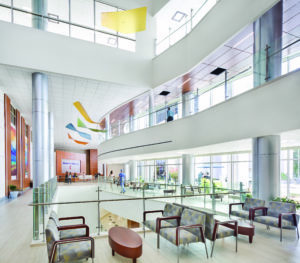 Alana Morris’ first lessons in interior design for healthcare spaces came while cutting her teeth as a new hire at ESa (Earl Swensson Associates; Nashville, Tenn.), working on a renovation/addition for Lewis Gale Medical Center in Salem, Va. Ultimately, she got the job done, and now understands and appreciates that every project—and every interior space—will come with its own unique challenges. And she should know. 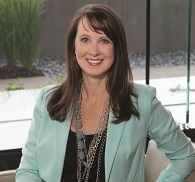 After 18 years, she’s still dedicated to healthcare, most recently working on projects for University of Central Florida Lake Nona Medical Center (Orlando, Fla.) and Methodist Hospital (San Antonio, Texas). “I enjoy the complexity of healthcare projects and figuring out how to implement stringent codes and regulations, while maintaining the integrity of the design intent to promote an optimal healing environment for all involved,” she says. What do you like best about working in interior design for healthcare? I like knowing that the spaces I design can positively affect the lives of patients and visitors, and provide supportive, efficient spaces for staff. I strive to create calming environments that promote health, safety, and well-being. Thumbs up: Hospitals becoming more patient-centric. I can rate my Uber driver; now I can rate my care. The HCAHPS scores are ultimately determined by the patient experience. Small details like providing patient amenities or designing to maximize natural light can have a big impact on the patient experience. Thumbs down: Overuse of wood-looking products. Typically, wood-looking products are incorporated to create a natural, warm, and homelike atmosphere, but it can get overwhelming when portrayed in sheet vinyl, casework, wall cladding, ceiling features, and doors—especially when used together. 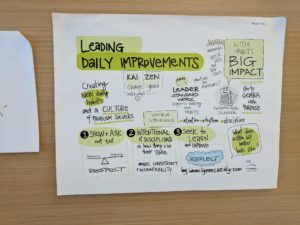 3 “Leading Daily Improvements” poster by inspirational speaker Lynne Cazaly to remind me to incorporate Lean concepts in my work. 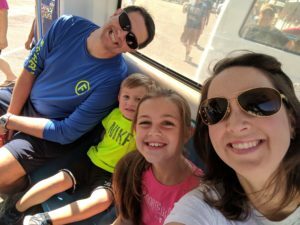 Outside the office, you’ll likely find me … With my family at sporting events or kid activities, going to the Nashville Zoo and, during the winter, snow skiing. Dog or cat? Dog. We have a 17-year-old Jack Russell/Boston Terrier mix that we adopted in 2004 from the Humane Society. Coffee or tea? Both! Coffee in the morning and tea in the afternoon. Window or aisle seat? Window, for sure. Best place to rest your head. First album you ever bought I don’t recall exactly, but I’m sure it was Tiffany, Debbie Gibson, or New Kids on the Block. Man, I’ve come so far in my music choices! If I wasn’t an interior designer, I would be … A hospital administrator, specifically on the operations side, maybe a COO. Weekend activity I like to relax and enjoy a cup of coffee on Saturday mornings before rushing off to get my kids to their activities. Color Spa-like shades of blue that are very calming. Guilty pleasure Peanut butter fudge milkshake. Snack when you travel Trail mix. Ice cream flavor Peanut butter or coconut. Sports College baseball and basketball, and professional hockey and baseball. Teams Vanderbilt, Nashville Predators, and St. Louis Cardinals. Hobby Since I have children, it’s become photography. I like capturing the moments! I also design and create my kids’ birthday invitations, thank you cards, banners, food labels … all paper supplies! Books Anything by Nicholas Sparks. A great beach read! City to visit Maui. It’s so beautiful, adventurous, and relaxing. In winter, it’s skiing in Deer Valley, Utah.